The area where I live is rather infamous for growing a contraband herb commonly known as ‘grass’. Personally, I think the human race should working on waking up rather than medicating it’s pain. But I’m playing with the possibilities of regular grass here. When I first started working with this plot of earth, the ground was like rock, with no worms or signs of soil life at all. 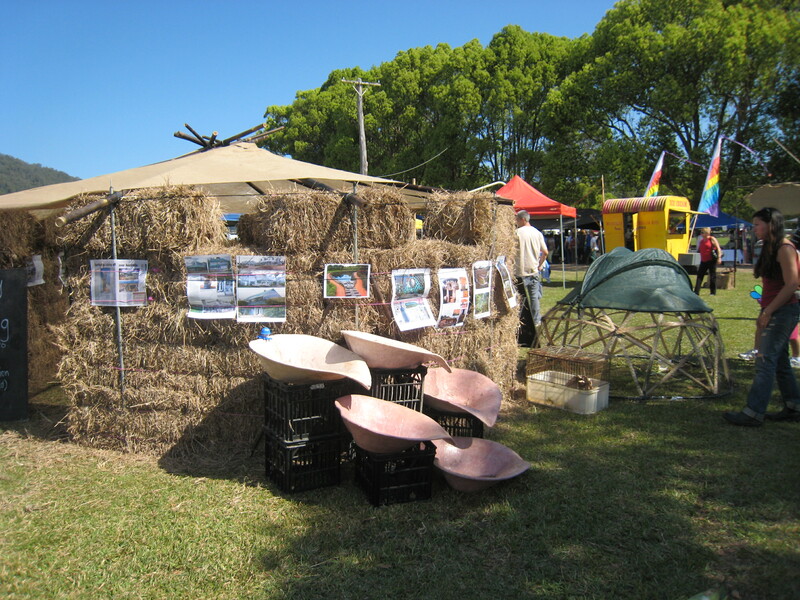 Most of the region had been seeded with a particularly tough variety of pasture known as setaria grass, for beef production. It is a hardy, vigorous clumping perenial that grows a foot a week in summer, reaching a height (that falls over) of up to 2 metres if not grazed by permanent livestock. Although, thankfully, it slows growing in winter, keeping it in check without constant grazing or weekly slashing in summer is impossible. Heavy cattle grazing & yearly burning off contributed to the compacted lifeless soil condition & so not an option for me. AND I don’t have a tractor. 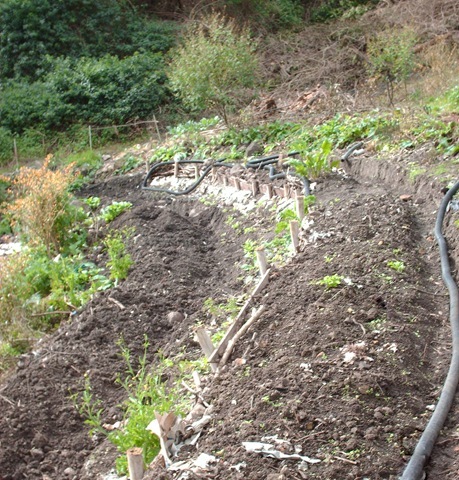 For lack of a solution, mostly it has been allowed to simply grow for many years & inadvertently added compost & protected the soil from erosion. The result, especially after the last few wet years has been a vast improvement in soil life & condition. However, the wet won’t last forever & long grass is a fire hazard in dry years & setaria is not the best quality grass for grazing ruminants; horses suffer calcium deficiencies & so too, most likely do other species. 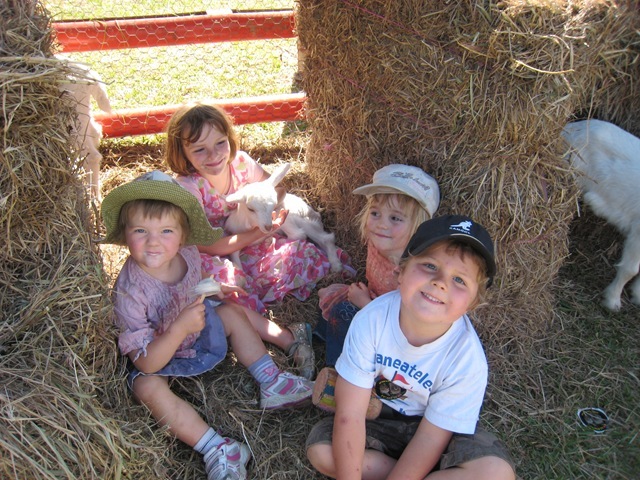 Grass is food for animals but a more varied diet is preferable. My plan is to intercrop with other grass & herb types by slashing in autumn when growth slows & seeding with lawn varieties & clover for nitrogen-fixing in open areas & roadways/access tracks as fire breaks. 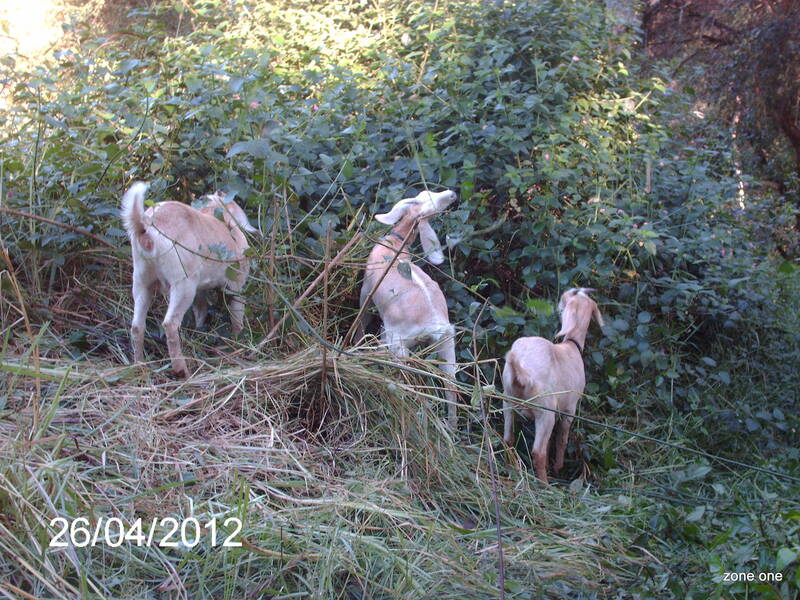 Once new pasture is established in a few months, the introduction of goats should help with maintenance over summer. 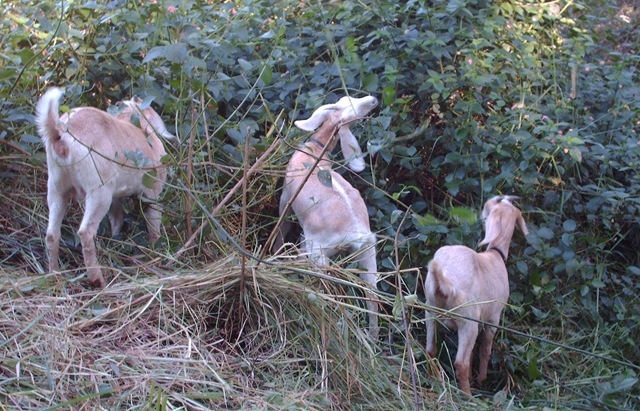 I have chosen goats for their usefulness in browsing brush & weeds & have found their barn/straw droppings a bonus in the vegetable beds; their small size does much less soil compaction damage & they conveniently eat more grass in summer & more brush in winter (lantana & woody weeds abound here). 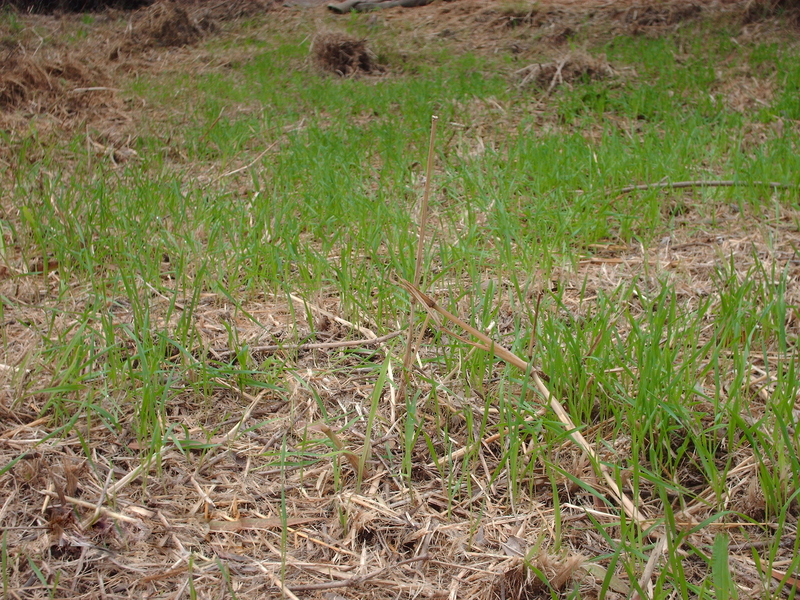 So far, I have reclaimed perhaps an acre or two by hand digging fully grown clumps of setaria grass, laying on contour & creating garden beds with the decomposing grass, a back breaking job of many years. 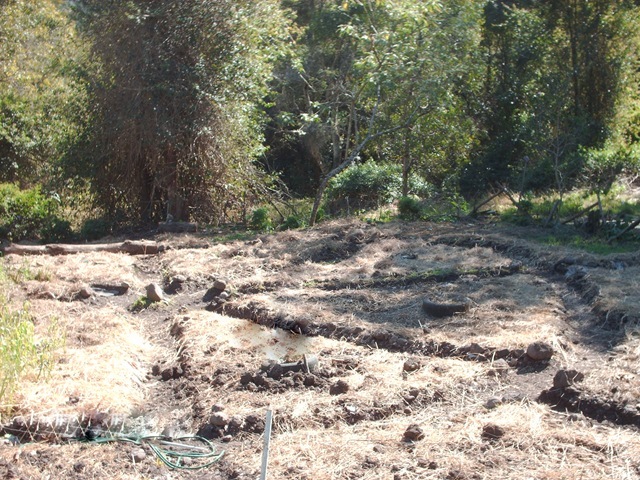 In fact, anywhere the grass isn’t over your head & looks like garden is the result of this work. Now I have a new method that looks unsightly for a time but far more effective- covering with old carpet or black builders plastic, leaving for months until the grass dies & directly planting into the resulting layer of mulch. 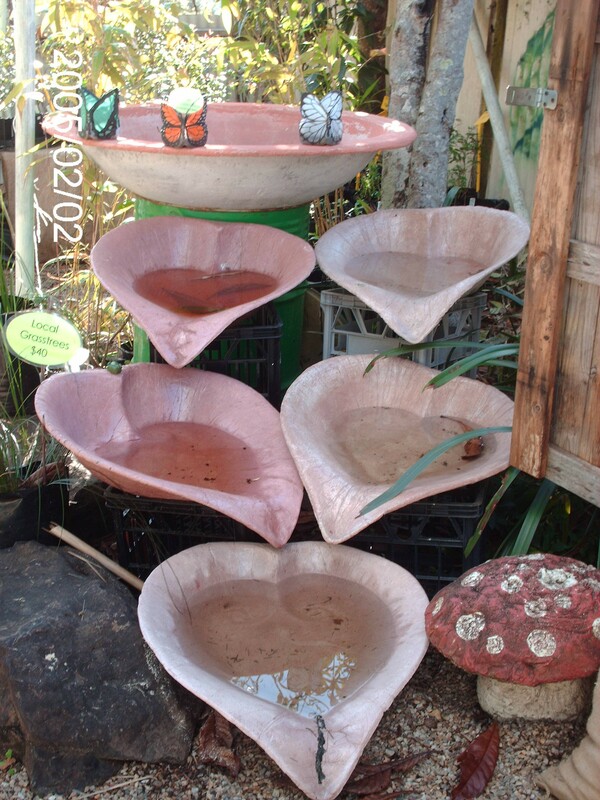 Instant garden! This piece of black plastic has been progressively rolled downhill & now the newly cleared area has been planted to linseed, a crop I tried a patch of last winter with great success. The great advantage of this method is not digging. I’ve found that as soon as one turns the earth or it is laid bare, a new nightmare begins, weed seeds that have laid dormant invariably sprout, creating more work in the cropping area. My latest grass experiment is to try inter-cropping grain into the permanent pasture, taking advantage of the dormant winter growth of setaria to interplant wheat & oats (a winter crop in Australia). Without tilling or disturbing the soil I have been spreading seed between the clumping grass (although the clumps are massive, they are almost a foot apart). After the harvest in spring, the permanent grass will re-grow to be grazed by the goats who will also manure & fertilize the area for the next season’s winter grain. That’s the cunning plan! Here’s the progress so far: first, cut the grass! Easier said than done- this stuff is like rope & has been un-cut for years, resulting in tangled masses that only the toughest brush-cutter, time & gritted teeth can conquer. Fortunately, I have the machine, although it took 5 tanks of petrol to clear the first 10m2! 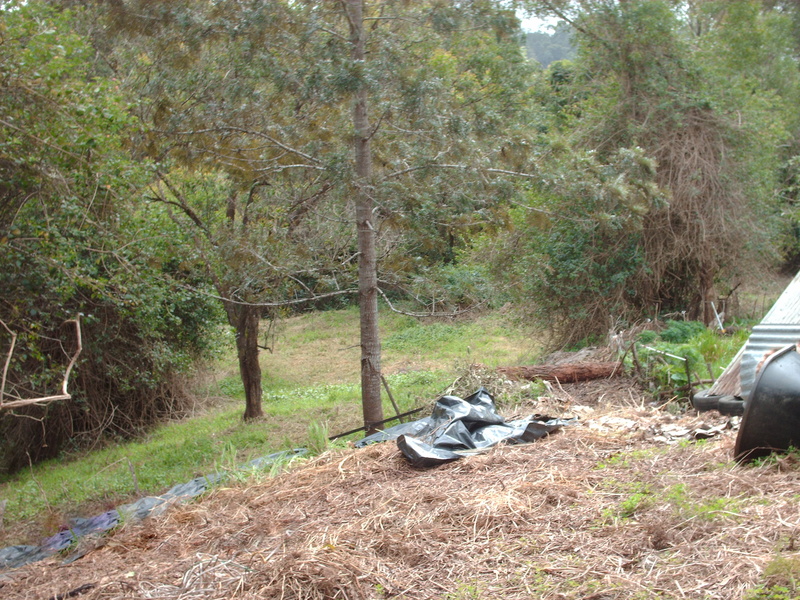 The pic at right is after the first cut before raking the mulch for the vege gardens. Did I say raking? Yeah right- no rake can get through it. Human tractor picks up with bare hands. 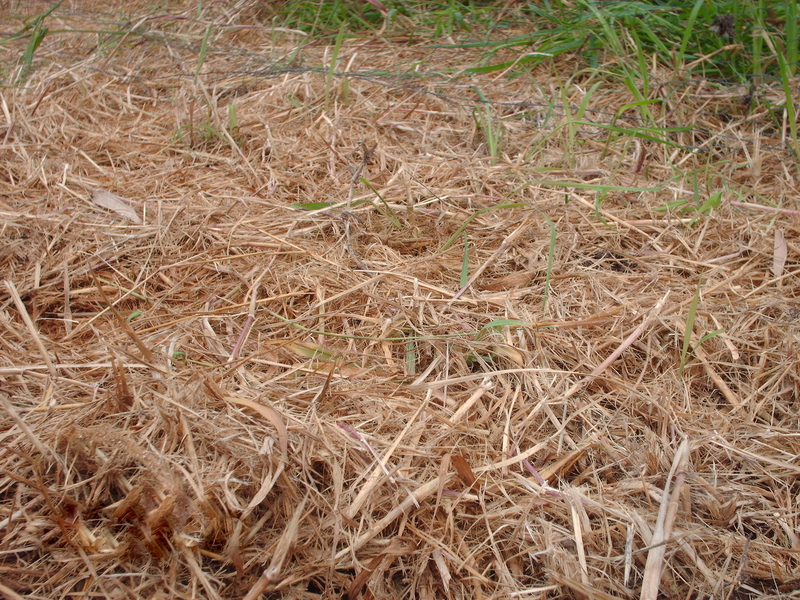 Next, after clearing bulk of mulch, leave to re-sprout one week & cut again. This picture will give you an idea of the monster grass I’m dealing with here. 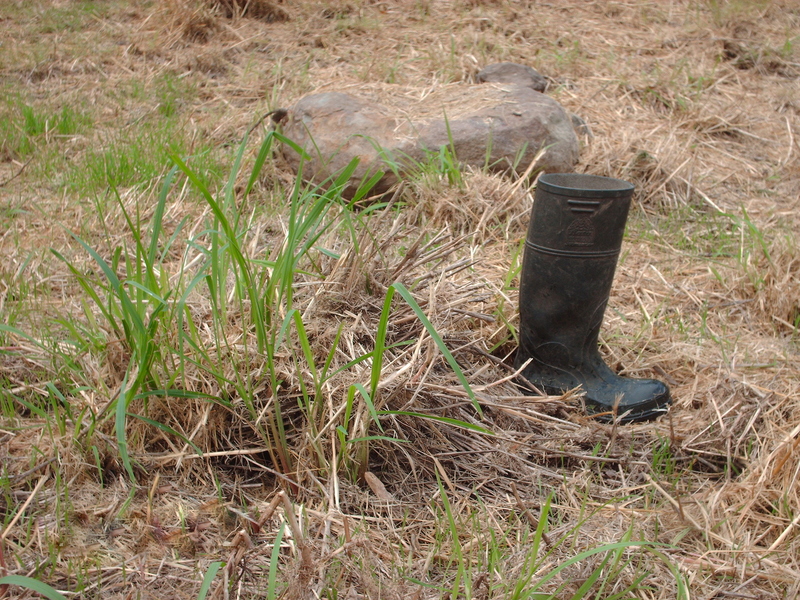 Next to the boot is ONE clump before the second cut. Grass is cut in the forth lunar quarter on the waning moon; hopefully it’ll stop growing. Hopefully (now late April). Now for the fun part. There is is still a good layer of mulch on the ground between the clumps. I don’t want to expose the soil or dig but take advantage of the very wet soil & use the mulch to cover,but the seeds do need soil contact. Human tractor gets low & dirty. Hands & knees, hand fork in one hand, rake surface mulch towards self, sprinkle seed, rake next section over first, one foot by one foot, across contour. 12m2of wheat sown in first lunar quarter (sow leafy greens). Left: soil bared for seeds before raking mulch over to clear next section. Ok, so this is madness, you may think. Why would I bother? This isn’t even a grain-growing area. Sub-tropical, mountainous ex-rainforest. Tell that to the traditional Asian populations of the world. AND I don’t have a tractor! 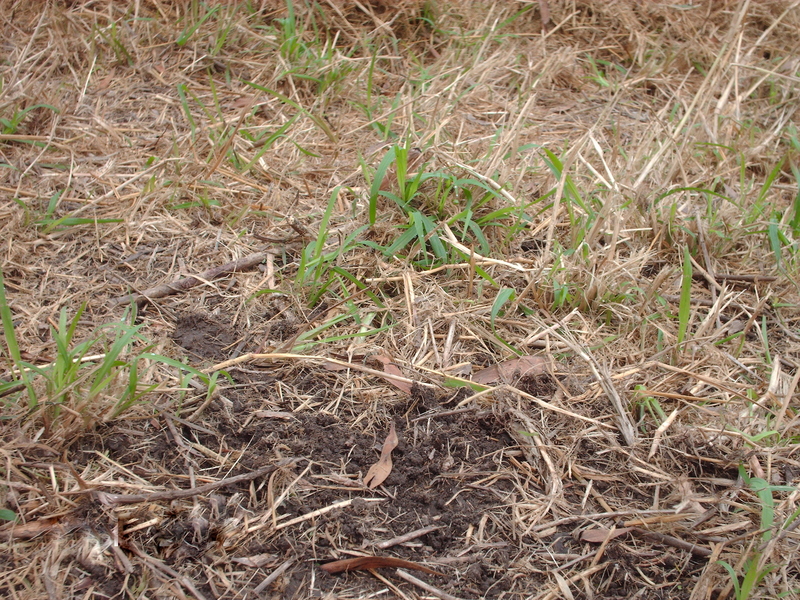 AND I don’t want to turn the soil, slowly returning to fertility after years of slashing, burning & over-grazing. Why even grow grain? Because I eat it! Because I’m not trying to make money & grow large areas. Because I have inadvertantly realized a tractor would have compacted this super saturated soil (one has time to think & observe when on hands & knees tending the earth). Will wheat even grow here? Well it did last year! I tried a small patch (5m) of biodynamic wheat from a farm some 100km from here- the nearest I could find. It grew fine & fortunately we had a very dry spring when it was heading (a usual pattern). 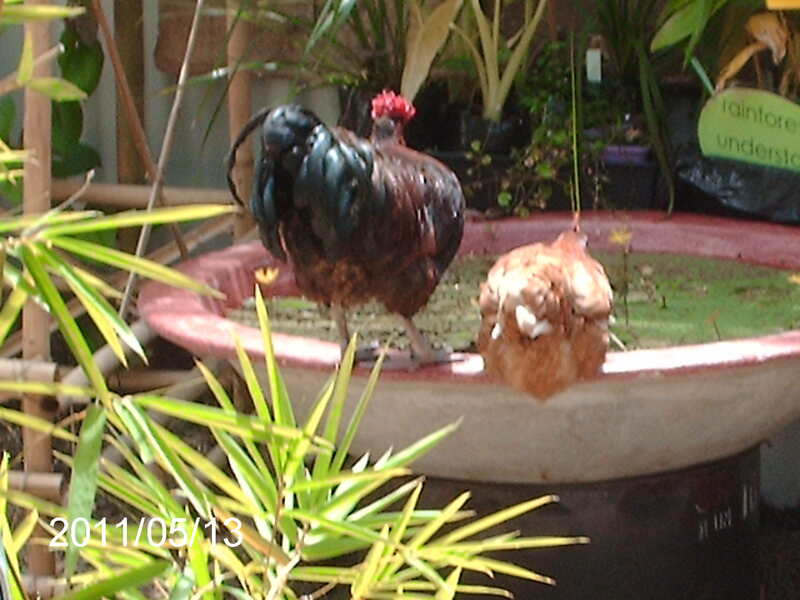 I saved the seed & have re-planted the small amount in the crop circle for extra care to save again. I plan to save (not eat) my seed for generations to breed a wheat variety acclimatised to my zone. Taking the time & trouble to do all this by hand is worth it to save seed, the most important thing any gardener can do in this age of multi-national take-overs of our sovereign right to food! 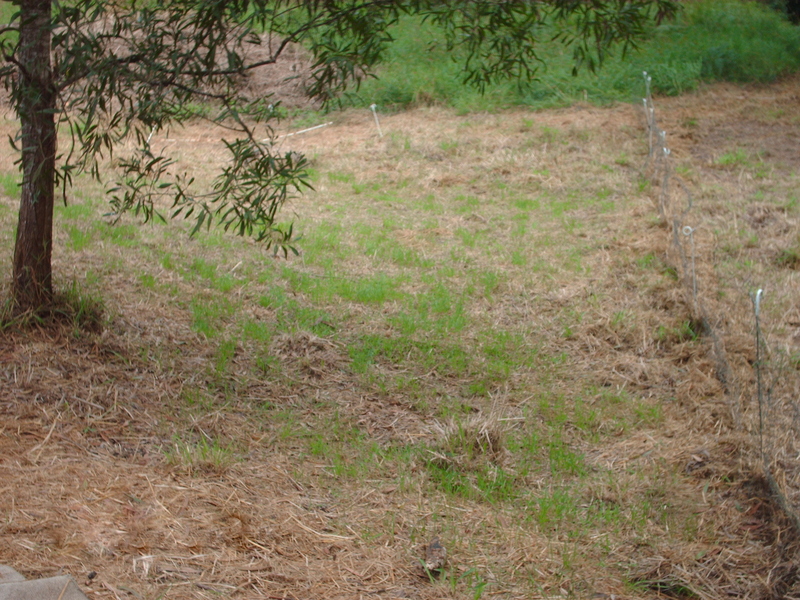 At left is the slashed area one week later, before sowing to wheat. After sowing, I cut grass to cover seeds.At right are the newly emerged seedlings another week later. Aren’t they beautiful? 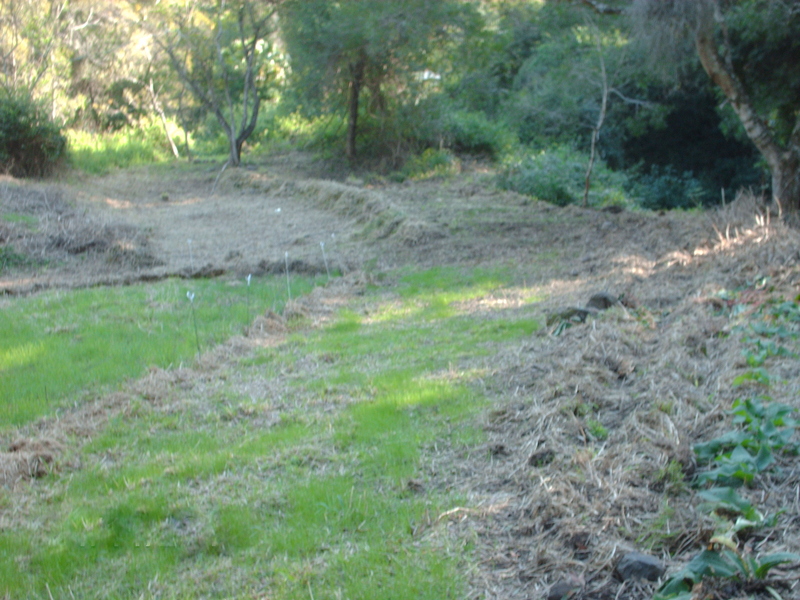 At the same time, I am applying the same process to an area adjacent to the ‘crop’ that I hope to keep low over summer as an access road/ fire break parallel to the creek line (which is being planted to native rainforest). The edges slope & I am created mini-terraces planted to sub-tropical tubers (ginger, galangal, cassava & jerusalem artichokes) as a living fence/windbreak. To the left is the new wheat crop, to the right, new pasture grass seedlings emerge, with root crop beds at the far right. Towards the rear is the next slashed & grass seeded zone one month later. 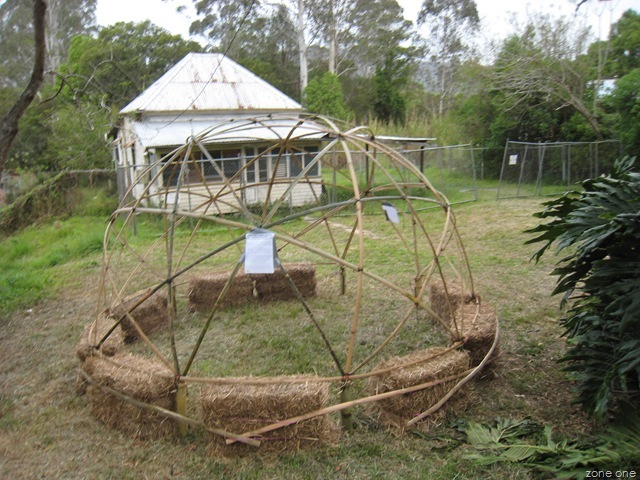 Above the grain growing area is the ‘crop circle’, now with an outer ring of wattle branches & up-rooted lantana. Late sunflowers, Oats & chickpeas have already been sown into this area & will soon also be planted with stone fruit, as this whole flat zone is liable to get frost at times. 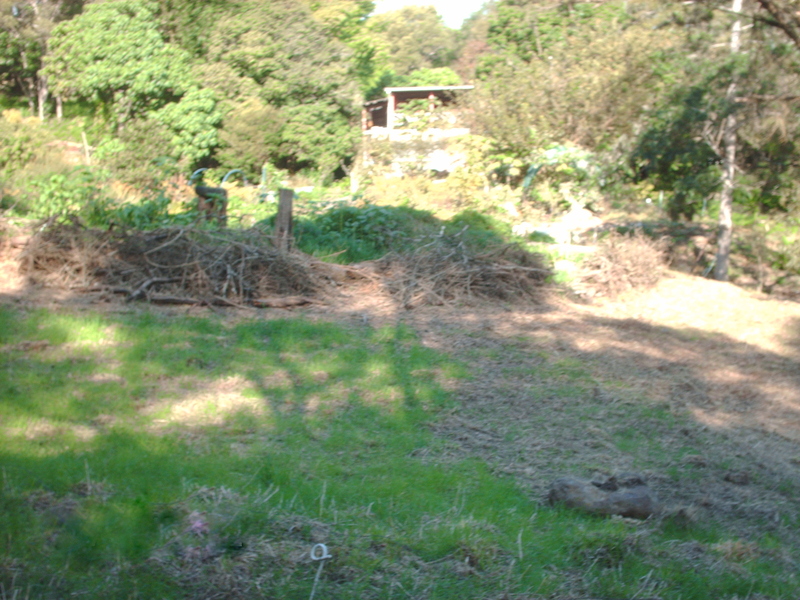 The crop circle (above right) is now being planted with a succession of winter vegetables, one segment per month. 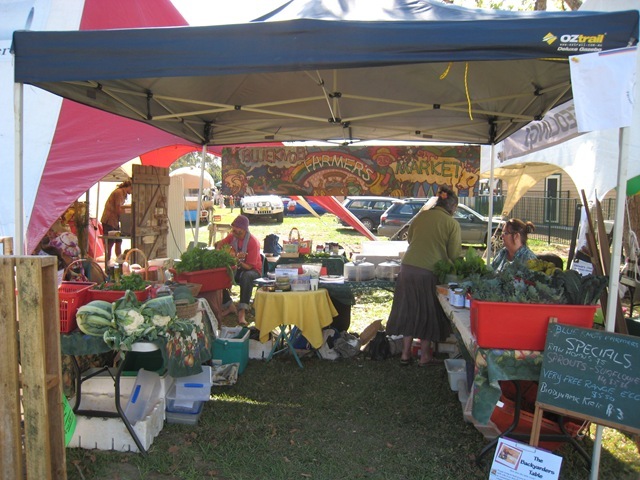 Note the ‘special’ wheat (from last years home-grown seed) to the top left of the photo. 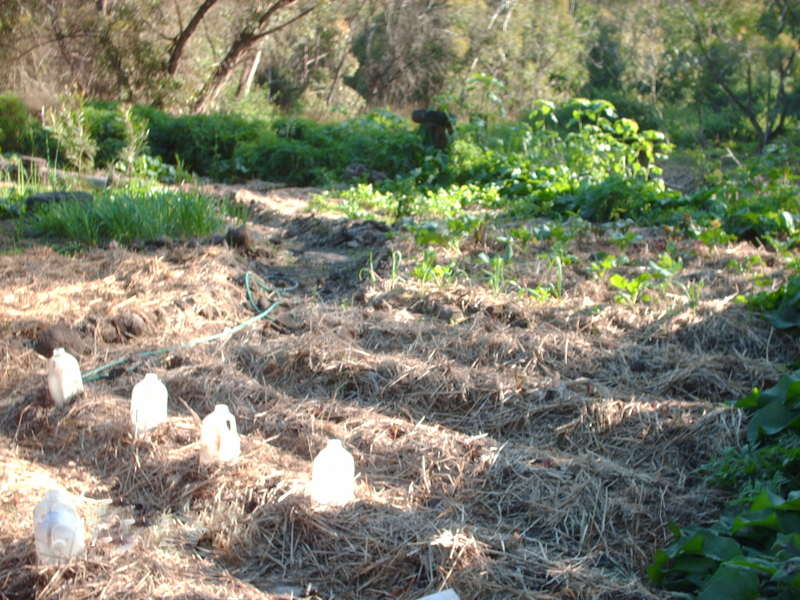 The milk carton cloches front left I now regard as indespensible to protect the new seedlings from wind, sun & insect exposure until their roots have established. So that’s the autumn planting, on to goat fencing preparations! 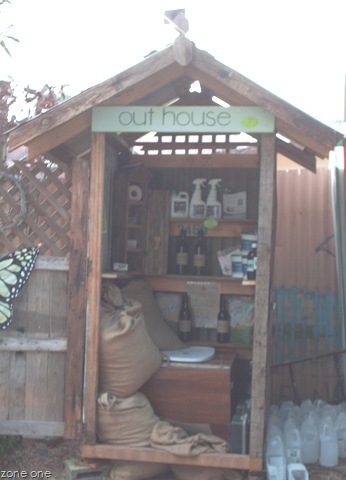 “People need the home they live in to take care of them” Michael Reynolds (the ’garbage warrior’, creator of Earth ships). Of course, this is what shelters are for, are they not? And yet, for so many in the modern world, houses are only a financial commodity, often in excess to their actual living needs, inefficient, poorly designed & made from all manner of energy intensive & toxic materials. 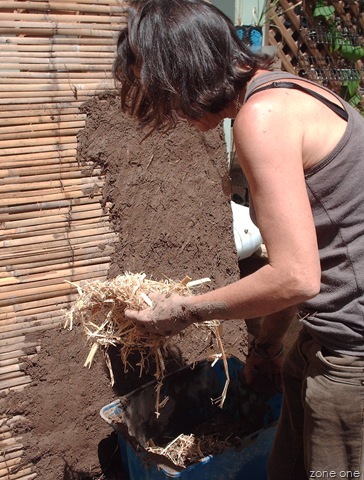 Below left: back to basics, Steph rendering with cob (subsoil & hemp hurd) onto bamboo screen. 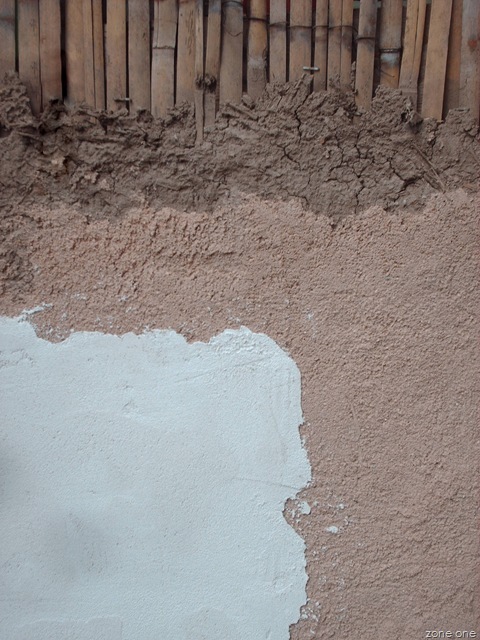 Below right: finished with Rockcote’s clay plaster & Rockcote’s finecoat clay plaster (white layer at bottom left of picture). No place like home: The most basic function of a house is shelter from the elements, a means of keeping dry from the rain, shaded from the sun & protection from wind and fluctuations of temperature. The local environment (climate & specific site conditions) should largely determine materials, layout design & building style. The placement of a building within the landscape is important too, minimising extreme exposure although allowing for natural ventilation & lighting. 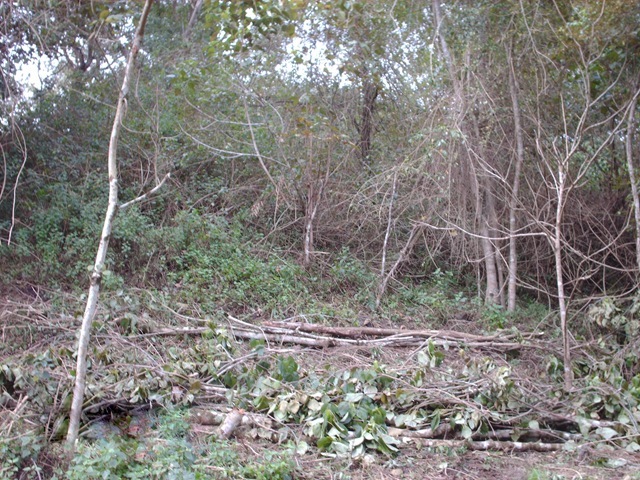 Surrounding vegetation can be used to modify local conditions. 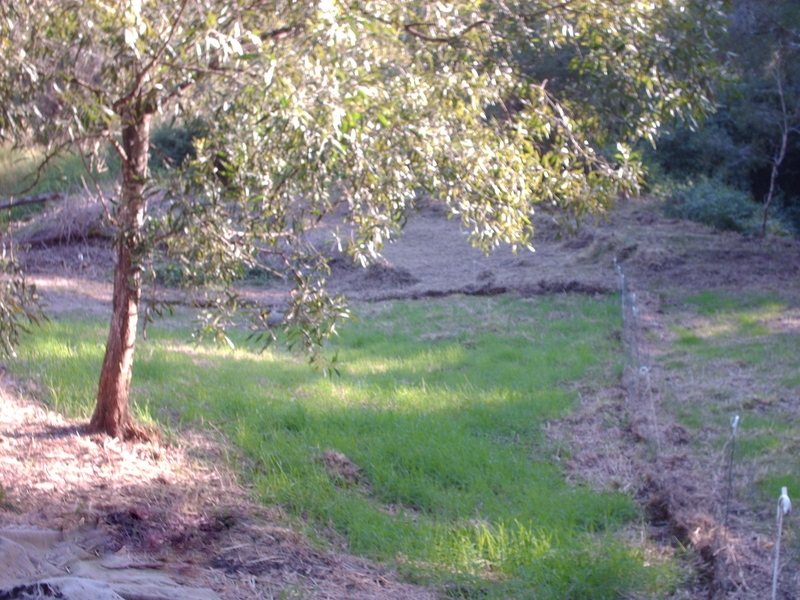 In my own experience, starting with an unbearably hot, bare paddock, after 3-4 years of planting trees, the house temperature became more moderate & now, after nearly 20 years of growth, the house remains cool in summer & barely a breeze blows through when distant trees are lashed by gale-force thunderstorms. Building (& planting) over a long period of time has allowed us to observe the change of sun angle over the seasons. Although shaded from the hot western sun in summer by deciduous trees, in winter the low morning sun stretches across 6m of veranda to warm the kitchen. 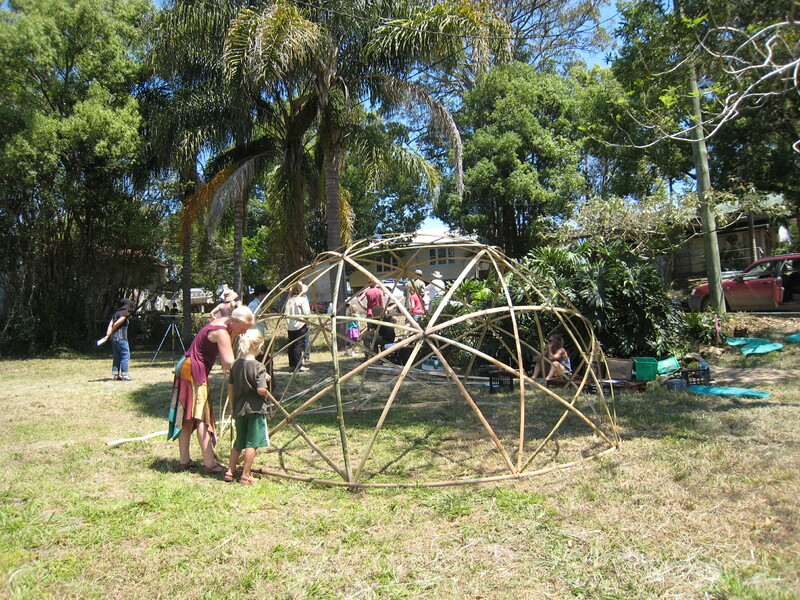 Hence the garden is an extension of the home, acting as a buffer zone to the wider world. Put a hat on: Durable roofing materials are perhaps the most convenient of modern building developments, although the pay-off is that they are also energy & resource intensive (iron sheeting, concrete, glazed fired ceramic tiles). Given that roofing is the most important function of a house, this investment is perhaps necessary & one should endeavour to ensure that whatever materials are used require minimal maintenance & have long life. Rooves made from component parts like tiles & corrugated iron can have damaged parts replaced. Extending the roof line with eaves or the ubiquitous Australian veranda also protects external walls from sun & rain damage, as well as aiding temperature control internally (stays cooler in summer). In my experience with building a ‘Queenslander” style home in sub-tropic northern NSW over a 10 year period, each additional veranda added created several degrees reduction in temperature in summer. 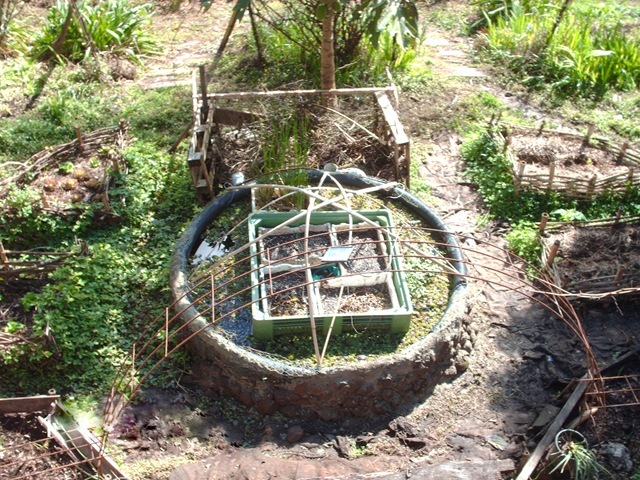 Not only does a roof keep water out, it is also an impervious layer that can be used to catch rain water (for drinking, washing or irrigation- depending on the air/water quality). Pathways, roads & kerbside gutters are likewise existing water channels that should be used for catchment in the dry as well as drainage when excessively wet. 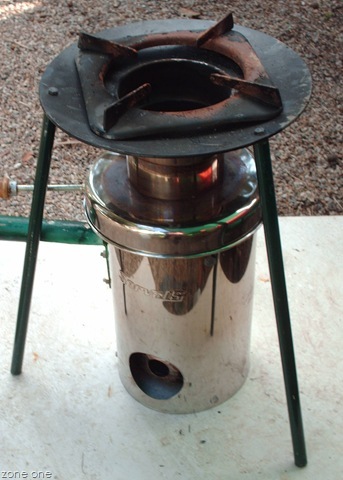 Efficient design is obtaining multiple functions from each element. Energy efficiency: Use no more than you need! Left: Solar light tubes installed in the Rainbow Cafe. 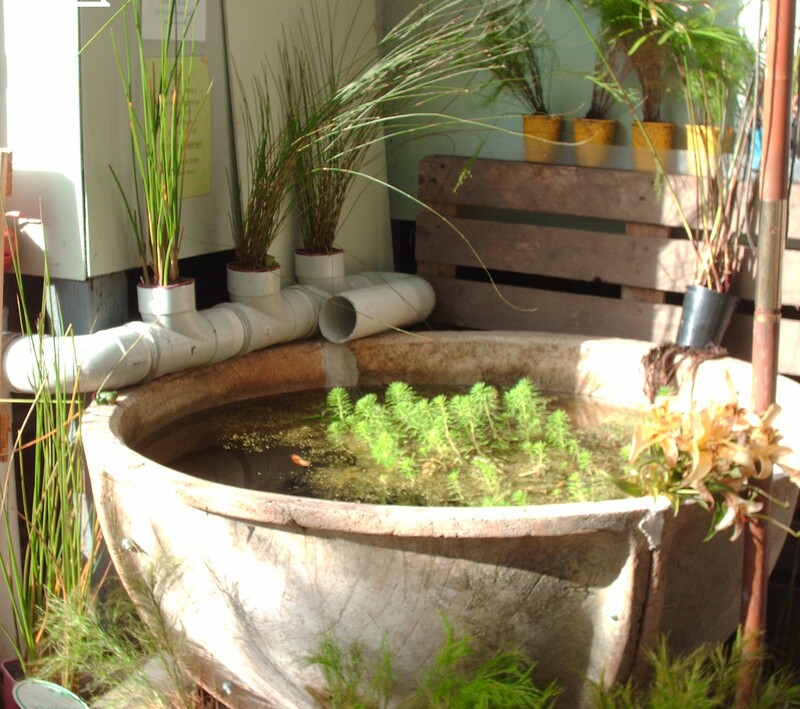 While designing & building a house from scratch is not possible for most people, there are many modifications that can be used to minimize energy use. As well as low wattage lights, skylights & reflective surfaces take advantage of natural light, reducing lighting costs. Most appliances now have comparative energy ratings- & yes, turning appliances off at the wall when not in use DOES make a difference. Heating costs can be reduced with insulation, covering windows with heavy drapes & using door stoppers to prevent drafts & of course, an extra layer of clothing uses far less energy than the heater! (Artificial heating & cooling may well interfere with our body’s natural seasonal adjustment & temperature regulation, leading to an increase in colds & flu. Do yourself a favour & toughen up!) In summer, make use of natural airflow (of pre-cooled air from shade trees & verandas) by opening windows & doors. Wear a wet scarf or shawl for personal evaporative air conditioning on those scorching days- you won’t believe how well it works! 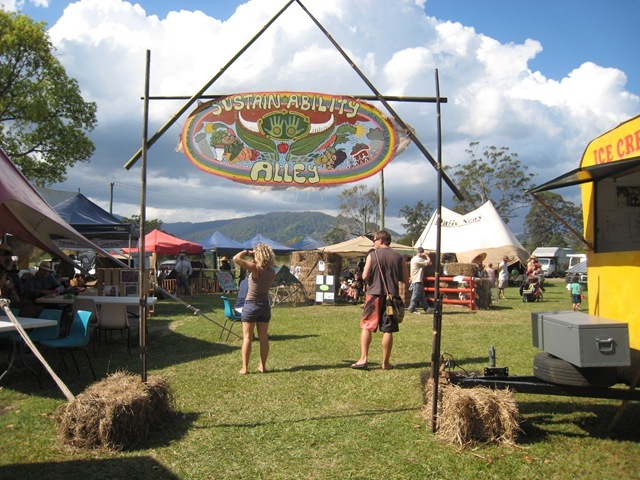 byron green building centre I worked for Deb at Painted Earth Eco-friendly Paints & Finishes in Byron Bay for 2 years & can vouch for her utmost integrity & dedication to finding environmentally responsible solutions for our homes. 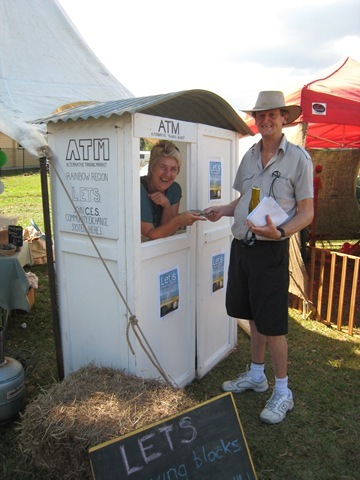 Now she & new business partner Dave have expanded their services to include all aspects of green building- the most all inclusive business of its kind in Australia! 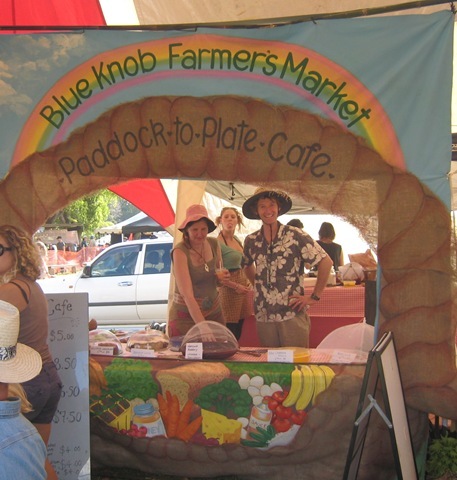 Even better, we created the first ‘Paddock to Plate’ cafe using ingredients sourced entirely from the Farmer’s Market. 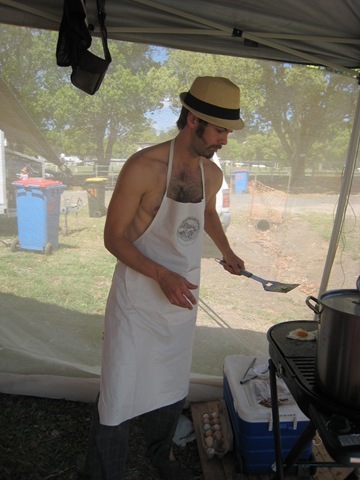 Naturally, it was well appreciated by the punters so by Sunday, word had spread & we had to start cooking breakfast early- it’s not every day folks get to sample preservative free local bacon & free range eggs (the rest of the menu pretty special too)! 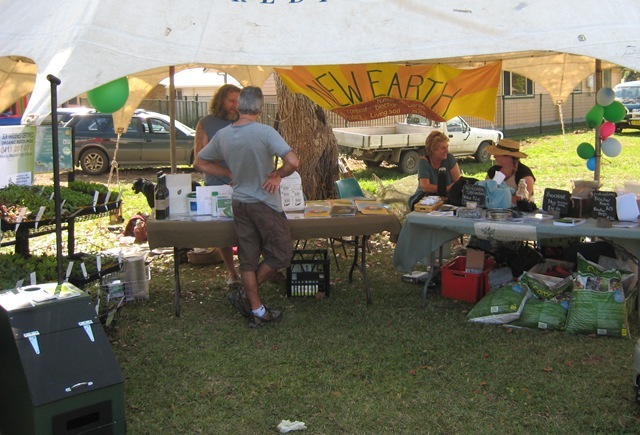 Right: Charmaster Dolph & Gilly at the ‘New Earth’ stall with biochar demos, Pooh Solutions composting toilets Effective Micro-organisms for waste treatement & soil remediation & Farmer’s Choice Organic Seedlings. 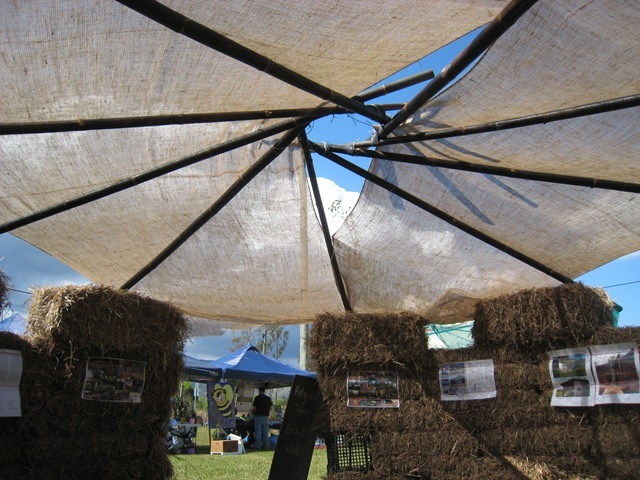 To demonstrate some hands-on sustainable practice, zone one created a straw-bale house at the centre of ‘Sustainable Alley’ with a bamboo reciprocal roof (many thanks to Jenny!). 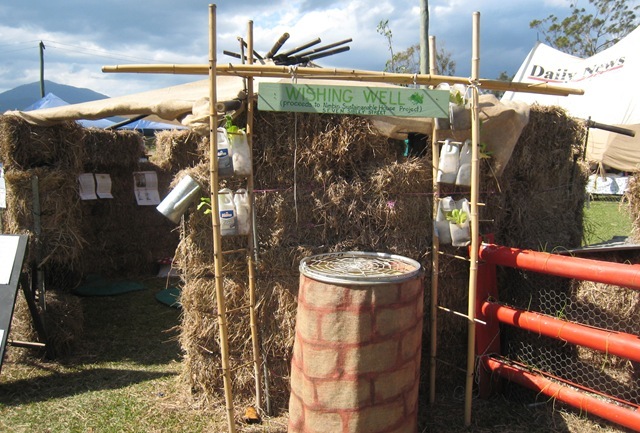 A wishing well (fund-raising for the S.E.V.E.N SIBLEY project) with vertical milk bottle garden, a pipe rail garden, flowform display, baby chook stardome & Jenny’s gorgeous kids for petting (baby goats that is) made the display a much visited attraction.